As director of Ecuador’s Geophysical Institute, Mario Ruiz has monitored some of the most active (and potentially destructive) volcanoes in South America. After earning his PhD at UNC 10 years ago, Ruiz has come back to Carolina to sift through data from the recent eruption of the Cotopaxi volcano. Photo by Mary Lide Parker. Cotopaxi, one of South America’s most dangerous volcanoes, emits a mixture of volcanic gases and steam on October 19, 2015. On a warm morning in mid-October, Ecuador’s colorful capital, Quito, buzzes with activity. Throngs of people move through the market in the Mariscal, Yaraví music emanates from cars stuck in traffic, and street vendors sell fragrant salchipapas and empanadas to tourists and locals alike. The equatorial city basks in the abundant sunshine and crisp air of the Andes mountain range. But on this breezy, blue-sky day, Quito’s alpine skyline includes an alarming sight — the Cotopaxi volcano, a massive snow-capped peak located 30 miles outside the city, is smoking. 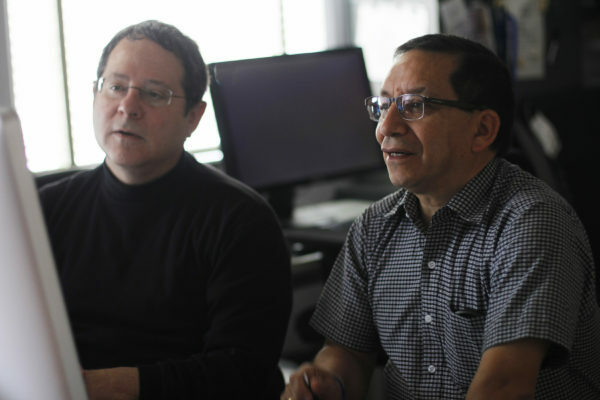 Mario Ruiz, director of Ecuador’s Geophysical Institute, hunches over his desk, stressed and exhausted. Over the past several weeks, he has been fielding requests from reporters and government officials. He shuffles through papers, pushing aside a copy of last week’s El Comercio with the bold headline: Four Months on High Alert and Still No Agreement on Volcano Emergency Plans. Today is October 19, 2015. Cotopaxi erupted two months ago, spewing ash across the town of Latacunga and some southern neighborhoods in Quito. Ever since the eruption, the volcano has continued to emit ominous clouds of gas and steam, while the ground beneath it rumbles. Meanwhile, Ruiz and his team work around the clock to monitor Cotopaxi’s seismic activity, trying to figure out if the ash blast was a singular event — or is a bigger eruption building? Seismic rumbling is a regular occurrence around volcanoes — dozens of minor earthquakes (only detectable by highly sensitive instrumentation) can occur in a week. But now the instruments on Cotopaxi are picking up continuous seismic events — over 100 a week. When Ruiz first started working at the institute in 1987, many of Ecuador’s volcanoes were quiet. “I was in charge of monitoring active volcanoes that weren’t very active,” he says. But in 1999, two volcanoes, Tungurahua and Guagua Pichincha, erupted at the same time. Meanwhile, Cotopaxi started to have more sustained seismic activity. He ended up spending three months in Antarctica, but never turned his attention away from the volcanic activity in his home country. “We have so many volcanoes in Ecuador,” Ruiz says. “They produce beautiful landscapes and fertile soil but they also pose very real dangers — over half the country’s population could be affected by them.” In the middle of his Antarctica research, Ruiz went back to Ecuador to install more equipment on Cotopaxi. Ruiz finished his master’s degree at New Mexico Tech, then came to UNC in the fall of 2003 to complete his PhD in geophysics. Lees kept his promise. The two volcanologists traveled to Ecuador together to install seismic and infrasound equipment on Tungurahua — the same volcano that inspired Ruiz to go back to school. 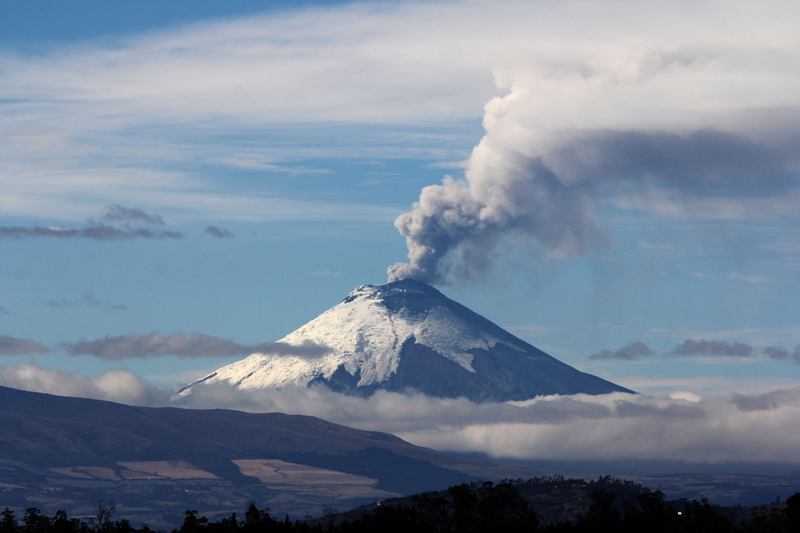 After writing his thesis on Tungurahua, Ruiz returned to the Geophysical Institute in Ecuador. 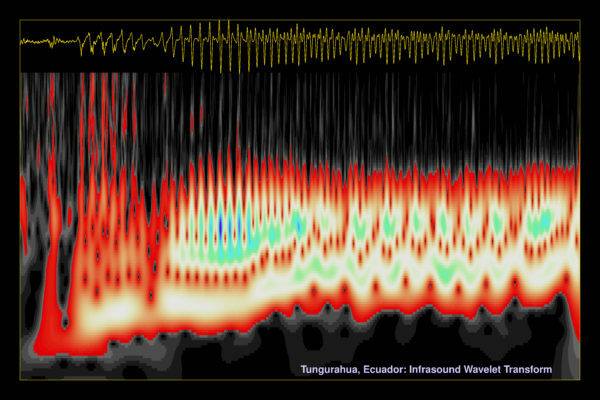 An image of an acoustic wave captured by an infrasound microphone on the Tungurahua volcano on July 3, 2010. One of the most heavily monitored volcanoes in Latin America, Cotopaxi is home to 14 seismic stations, five infrasound sensors, four detectors of volcanic gases, and a system to detect whether or not magma is moving in the volcano’s conduit. Despite all of Cotopaxi’s instrumentation, all the modern advancements in seismology, and all the hard work conducted by Ruiz and his colleagues, predicting exactly when and how the volcano will erupt is a dubious process. In fact, most volcanologists avoid using the word “predict” at all — analyzing seismic activity is not like forecasting the weather. When Lees was a PhD student at the University of Washington in 1984, he talked with Steve Malone, a research scientist involved in tracking the seismic activity leading up to the massive eruption of Mt. St. Helens on May 18, 1980. Malone and his colleagues had made accurate estimates about when the volcano would erupt, but did not anticipate the nature of the eruption — a massive lateral blast that produced the largest debris avalanche in Earth’s recorded history. Just a few years later, a lack of understanding mixed with some disagreement among authorities resulted in a massive loss of life from a volcano in Colombia. On November 13, 1985, one day after officials deemed there was no immediate danger, Nevado del Ruiz erupted. While the eruption was relatively small, its lava melted enough ice on the volcano’s high summit to create a major lahar, or mudflow, wiping out the town of Armero and killing over 20,000 people. “The politicians and agencies that are supposed to warn people in that valley had disagreements about whether there was danger or not,” Lees says. But the reverse — playing it safe and calling for a mandatory evacuation — produces different problems when an eruption doesn’t come. In 1982, USGS geologists issued a notice of potential volcanic hazard (the lowest level of alert) to the resort community of Mammoth Lakes, California. Perhaps the devastation caused by Mt. St. Helens two years earlier was still too fresh in peoples minds — after the notice was issued, housing prices dropped 40 percent overnight. The nearby Long Valley caldera continued to produce some small earthquakes, but no eruption came. By 1983, the seismic rumblings had quieted down, but it was another three years before the local economy began to recover. Ruiz and his colleagues work over 12 hours every day. When something happens — a jump in the number of seismic events, for example — Ruiz’s team has to act fast. They evaluate the signals to the best of their ability, and then translate the data into a statement for the authorities and the general public. At 19,347 feet, Cotopaxi is topped with a glacier year-round. Molten lava could melt that glacier and its surrounding snow and ice to create devastating lahar, similar to what happened on Nevado del Ruiz. Lahars are often referred to as mud flows, but they are much more than that. “It’s not just mud,” Lees says. “It’s this thick mixture of ash, mud and water, but can also include tree trunks and boulders — it’s very dangerous and moves very fast.” When the flow of destructive debris comes to a halt, it solidifies like cement. Because of the urgent need for information during Cotopaxi’s heightened activity, Ruiz and his team simply did not have time to comb through their data in the same way that they typically would. And the UNC Department of Geological Sciences is the place. Lees does this using a statistical platform called R. “You have to decide what you’re looking for,” he says. He writes programs to identify patterns. The software can run through the data quickly and make a decision about whether it was run right, and then do it again — hundreds, or even thousands, of times. One of the basic measurements they collect is the peak-to-peak amplitude — the size of the waveform generated on the seismograph. “It’s the simplest thing, and we store that for each event — so there might be 20,000 of those,” Lees says. Mario Ruiz (right) and Jonathan Lees discuss acoustic waves recorded from their infrasound equipment. In addition to working on volcanoes near the country’s capitol, like Tungurahua and Cotopaxi, Lees and Ruiz have colleagues and research interests across Ecuador, including the Galápagos Islands. Wherever they are, Ruiz notes they usually receive a warm welcome. “The population is very friendly to volcanologists,” he says. Jonathan Less is the Chair of the Department of Geological Sciences. Mario Ruiz is a visiting lecturer in the Department of Geological Sciences. The Cotopaxi volcano erupted on August 14, 2015 and continued to emit a mixture of ash and steam until December of 2015. From their analysis of the data thus far, Ruiz and his colleagues have uncovered an abnormal series of seismic events three months ahead of the eruption.